After the disappointing ending of an awesome mecha anime, Valvrave The Liberator, Sunrise quickly fill in that sadness with Buddy Complex. Another mecha anime taking place on Earth, and oh time travel. The story begins with a battle over the ocean with a damage mecha thrust into a wormhole. Shortly after, we are introduce to the protagonist, Aoba Watase, on his first day back to school from summer break. Not long after, Aoba finds himself attacked by the damage mecha where we learn is from the future. However, before the damage mecha can kill Aoba, he's saved by his classmate who also happen to be from the future. During the escape, Aoba soon find himself in the future in the midst of a battle. Why I think you should watch it? If you are interest in mecha and time travel, then this is for you. With that said, it's shaping up to be a typical mecha anime from the animation quality to the story. However, there is the mystery as to why Aoba is important to the future and more action than your typical mecha anime (which is usually 15 minutes of talking and 5 minutes of fighting). And it's only the first episode, so it could get better just like Valvrave. 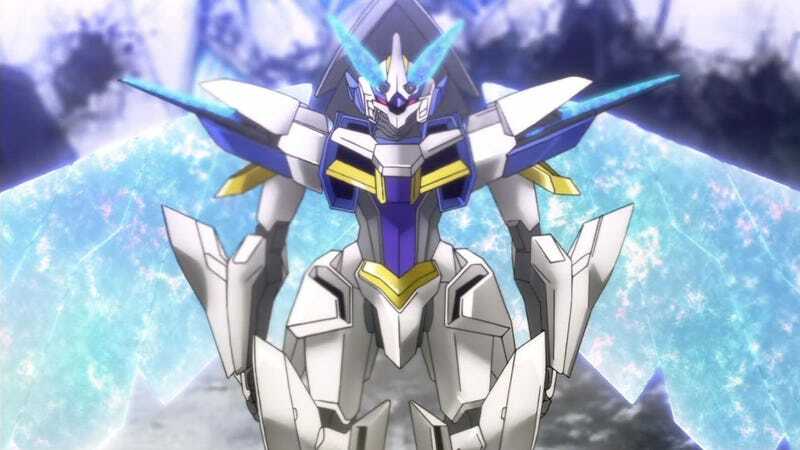 Oh and as for the mecha design, feels like a mix of Gundam Age and Valvrave.